Titan Comics: SCARLETT COUTURE #3 Review | Warped Factor - Words in the Key of Geek. Beautiful. Intelligent. Deadly. Scarlett Carver is all of these things, and more. She’s a spy. Des Taylor delivers another beautiful comic book, and one that's packed with action and espionage from start to finish. You know the score by now (if not, why not? Go, buy issues #1 & #2 of this comic book TODAY), Scarlett Carver is Head of Security for her mother’s internationally renowned fashion house, and also gathers intelligence for the CIA. 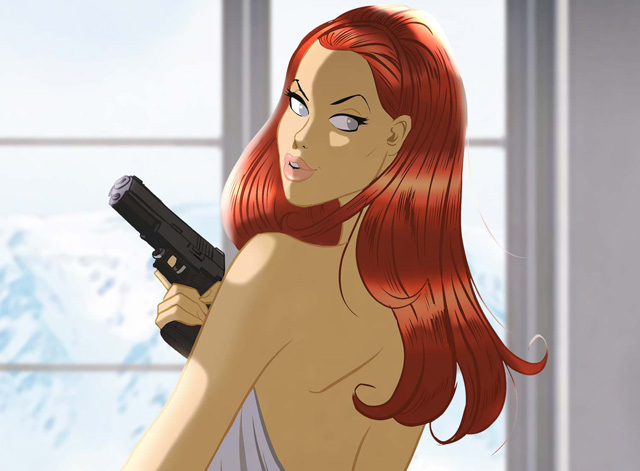 She's part James Bond, part Sydney Bristow from Alias, all wrapped up in the body of a supermodel. Having rescued a kidnap victim and escaped an explosion by the skin of her teeth, Scarlett finds the clock is ticking if she is going to discover exactly who is behind the murders of seemingly innocent models – and what it is that they want! Scarlett's got an impressive pair of distractions herself, and in that 'eye candy' dress of hers, boy does she know how to use them! Issue #3 of Scarlett Couture does nothing to dampen my mildly disturbing Scarlett Carver obsession, in fact quite the opposite. I was just about keeping it together whilst Scarlett saw off a team of security guards with a little help from her 'leading ladies', but then things took a delightfully unexpected Sports Illustrated Swimsuit Edition turn. Oh boy. This comic should come with a health warning! Story wise, the plot moves along swiftly. There are some large clues dropped regarding Scarlett and her family, and some surprises to be discovered under the ocean. A surprising symbol to be exact, and one that rarely means anything good. It's all coming together very nicely as we lead up to a BIG showdown in the fourth and final issue - did I say final issue? Noooooooooo! Des Taylor, I beg of you, don't take my Scarlett away. Surely Ms Carver deserves an ongoing series? Scarlett Couture is released on Wednesday June 24th. Check out some cool advance art previews here.